The Mando’ade are an ancient people, and it would be neither appropriate nor practical to recount our entire history here. Instead, the history that follows is a retelling of the pertinent events since year 5 CGT. It is true that the power of the Mando’ade who existed before Year 5 CGT was a shadowy remnant of the military powerhouse that held the galaxy by the throat under the leadership of te Ani’la Mand’alor. The Mando’ade were spread out, and the central government led by Mand’alor held only Manda’yaim and a few of the surrounding worlds. 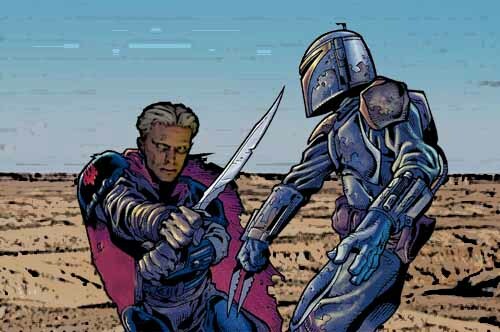 The culture, the most important part of Mando’ade life and only identifying characteristic of a Mando’ad, was mostly intact, although there appears to have been an increased emphasis on bloodlines, a sad parting from the ancient proverb which states “Gar taldin ni jaonyc; gar sa buir, ori'wadaas'la.” (Bloodline is not important, but you as a father are the most valuable thing). These conditions, coupled with the fact that the Mando’ade were led by a weak Mand’alor, led to the possible usurpation of the title of Mand’alor by an imperial by the name of Tyr DeMeer. DeMeer, claiming his Mando’ade heritage through blood, challenged and defeated Mand'alor, taking the title as his own. However, many other clans opted to not follow the usurper and instead opted for "ba’slan she’vla" (strategic disappearance). Several also later fled, out of disagreement with DeMeer’s unique views and practices. Although shunned and cut off from home, they lived as they always had. They drifted from place to place and job to job as mercenaries. Years passed in this way, and they clearly took their toll on Ba’slan She’vla clans, whose strength and numbers dwindled considerably. However, Kai Oryk, a member of one such clan, decided he would not let these people die without a fight. After telling one of his friends, a wealthy ex-pirate by the name of Derek Shado, of his plans, Shado offered to provide the initial funding for a venture to formally reunite Ba’slan She’vla clans. Negotiations began with several groups for a new Yaim for the proposed organization, but one was finally found on Argovia, a small temperate world in the Argovia system of the Endocray sector. Once the planet was obtained, a camp was set up and the call for unification sent out. The response was immediate and within days, representatives from dozens of the scattered clans arrived on Argoiva and pledge their support to Kai’s cause, proclaiming him leader of their crusade. 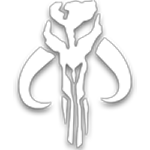 This new group formalised its structure on Day 280 of Year 9, CGT, and adopted the name “The Mandalorian Neo-Crusaders” like the ancient group of the same name. The Neo-Crusaders rejected the current Mand’alor and called for a new crusade to bring honour and glory to the Mando’ade. Things went well initially, and the clans began to flourish once more. Although jobs were few and far between, those that were taken were handled with the extraordinary proficiency and quality befitting Mandalorian mercenaries, and the group’s reputation began to grow. The clans remained unified until Year 10, Day 81 CGT when disagreements between Shado and Kai, regarding Shado's contemptuous conduct, came to a head. On this day, Kai decided that enough was enough. The unification would not last while Shado tainted the Neo-Crusaders, and the organisation couldn’t operate with such a paranoid leader, following Shado's usurpation of the group, whilst Kai and most of the Mando'ade were fighting a contracted battle in the outer-rim. Kai resigned, left the organisation, and invited the other Mando’ade to do so as well. Every clan agreed that Kai was the leader they would follow, and every Mando’ade, to the last, left the Neo-Crusaders and joined Kai’s exodus. Directly after the exodus from the now-defunct Mandalorian Neo-Crusaders, the group of clans continued their mercenary style and returned to their nomadic life; moving from job to job. As the contracts came and went, the collective amount being raised grew and with the discovery of even more vode, from their journeys to other parts of the galaxy, the Mando’ade clans were once again thriving to an exuberant level. It was only a matter of time before the clans found a new home, which could not only sustain their work, but also offer them the ability for a more permanent settlement. Naming the planet Manda to "Evaar’la’yaim", the clans set about the formation of a more public group, to allow them the ability to fulfill their initial wish: to unite all of the broken Ba’slan She’vla aliite (clans), offer a safe haven for all their vode and bajur’ir (educate) the ignorant masses of aruetiise about Mando culture. 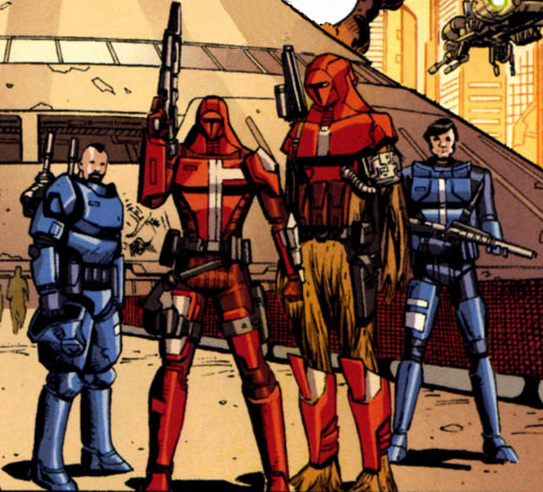 On the 167th day of year 10 CGT, the group publicly announced the founding of the mercenary group, Mando’ade, led by Kai Oryk.